For my upcoming birthday, my BFF gave me a pile of blueberry products she got up in Michigan (a.k.a. blueberry heaven) -- she knows it's my favorite fruit. One of the items was blueberry mustard, which set me on a quest to use some late-season berries in a somewhat unusual way. 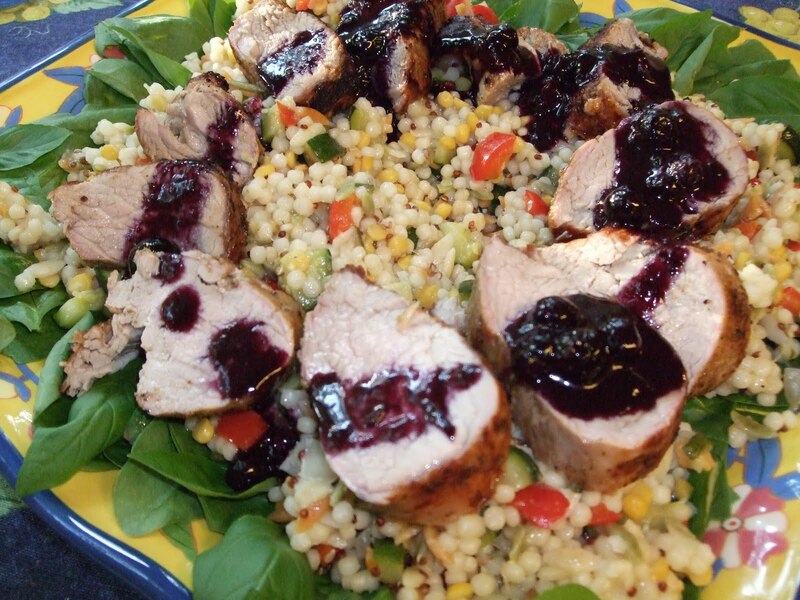 If you don't have blueberry mustard, that's fine -- just use regular mustard in this recipe. For company, I had it with grilled pork tenderloin, served here (in photo) on a bed of greens, mixed veggies and grains. The sauce received rave reviews! I had enough leftover to sauce another dish; I popped it in the freezer for now and will likely use it with chicken or fish in a couple of weeks. In a flat bowl large enough to hold the tenderloin, mix together garlic and canola oil. Season pork with salt and pepper and place in bowl. Turn pork to coat all sides with garlic mixture. Cover and refrigerate for at least one hour and up to 6 hours. Remove pork from marinade and scrape off garlic bits (they will burn when grilled). Preheat a grill until hot. Cook pork on medium-high heat to desired level of doneness. Heat the olive oil in a medium frying pan and add the shallot. Stir and cook for about 3 minutes, until shallot starts to soften. Stir in blueberries, wine and mustard. Cover and reduce heat to low. Cook for about 5 minutes, then uncover and increase heat to medium-high, letting mixture boil and give up some of its liquid. Add lemon juice, sugar and seasonings. Taste and adjust as needed, adding more sugar if you think it needs it. Let pork sit on a cutting board for a few minutes after you remove it from the grill. Slice pork thickly (about 1 1/2 to 2 inches) and arrange on a platter. Top with a small amount of sauce, then pass the rest of the sauce in a gravy boat at the table. What Matters More: Diet or Exercise? Ideally, we'd all like to be thin and athletic, right? We'd never eat junk, fit perfectly into our skinny jeans and compete in marathons, or at least be able to run up flights of stairs without getting winded. But since most of us can't do all that, it's interesting to think about what our top health goal should be. Well, according to new research, it seems that being active -- getting regular exercise -- is more important than dropping the pounds. "Is your health goal to get thin or to get active? Science suggests it may be best to think more about breaking a sweat than about stepping on the scale. "In a recent study, being inactive translated into a higher risk of heart disease, regardless of a person's body mass index (BMI). "BMI is a measure of overall body weight that takes into consideration a person's height. Medical experts have used it as an indicator of body fatness and thus a tool for determining disease risk. But in a recent study, inactive people were in a higher heart-risk category no matter what their BMIs were. Seems their couch-potato ways translated into a disproportionately big waist, irrespective of how much -- or how little -- they tipped the scales. And a too-big waist means big trouble for the heart. "Having a BMI within a normal range is great, but it's not the be-all and end-all of good health. You can have a normal BMI and still be unhealthy -- especially if you don't exercise. In the recent study, inactive men had a higher risk of future heart disease compared with active men. Again, this was regardless of BMIs and bathroom scales. Inactive women fared even worse than men when it came to heart disease risk, and it's all because activity affects body proportion. Exercise makes it less likely that your body fat will get stored in the most dangerous place you can store it: around your abdomen." My husband wanted to share his daily breakfast creation with Healthy Foodie readers. He makes this creative cold cereal concoction seven days a week, and swears by not only its health profile but also its tasty excellence. 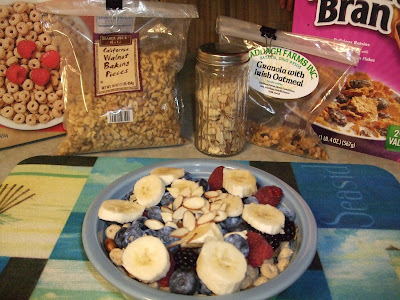 He mixes three different cold cereals -- raisin bran, Cheerios (the Trader Joe's house brand) and some granola, usually from a local purveyor called Claddagh Farms. Next comes chopped walnuts, sliced almonds and as many types of berries as he can fit into the bowl. There are always blueberries, and raspberries and/or blackberries if they're on hand. He tops it off with a banana and adds skim milk. Every day, without fail....plus coffee and orange juice. This beautiful summer dinner will feed eight hungry folks -- all you need to serve it with is some crusty bread with olive oil and a dry white wine of your choice. Of course, you can cut the recipe in half if you're not feeding that many people. Grill (or saute) tuna and salmon to your desired level of doneness (I like medium rare tuna and medium salmon). Let cool, then slice into bite-size pieces. 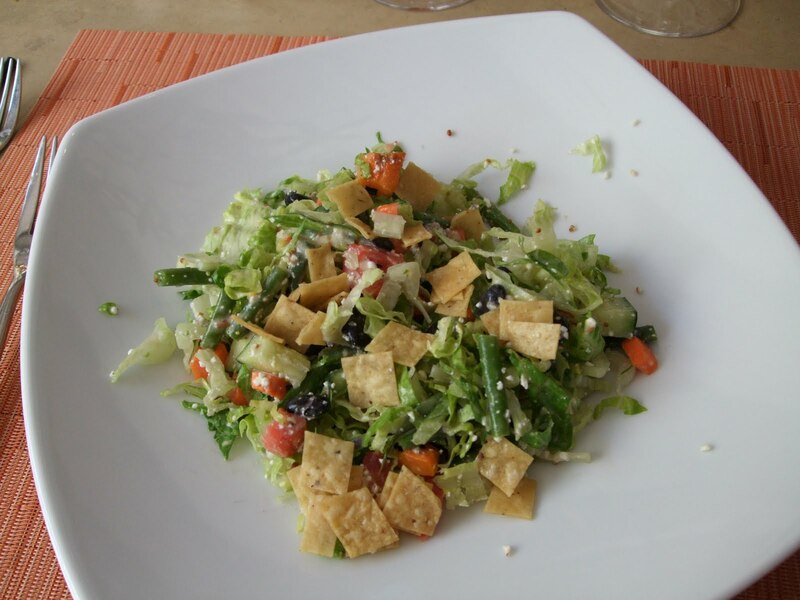 Dress the salad greens and spread them onto a large serving platter. 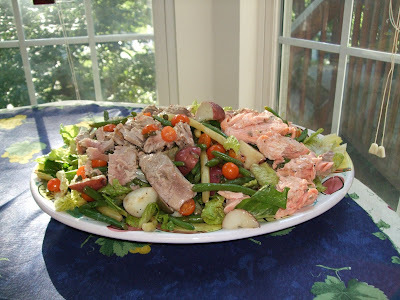 Sprinkle green beans, tomatoes, potatoes and capers evenly over the greens. Place tuna on one side of the platter and salmon on the other side (or mix the two fish together -- your choice). Serve, passing additional dressing at the table. My BFF treated me to (early) birthday lunch at downtown Cincinnati's trendy Mexican resto, Nada. This is one of the city's most hopping bar scenes, patio crammed on a gorgeous late summer day, filled with young movers and shakers scarfing down tacos, guacamole and baskets of tortilla chips. We settled in and ordered our margaritas. Then we looked around. Not ONE alcoholic beverage in sight at nearby tables. I must be overly influenced by the glamorous, fictional world of "Mad Men," nostalgic for the boozy lunches of yore. That's not modern work-ethic America, you might say. But what's the matter with these thirty-somethings, can't they handle their cocktails? I heard Jerry Della Famina, the ad exec whose agency reportedly was the model for "Mad Men," telling an NPR interviewer that if anything, in the 1950s and '60s they partyed even heartier than the AMC-TV series depicts -- and did a lot of creative, award-winning work after enjoying their three-martini lunches. For better or worse, times certainly have changed. The margaritas were delicious, and our shared vegetarian tacos (very tasty filling) and "goat cheese quesadilla salad" were good if not great. Disclaimer: I just returned from the southwest including Santa Fe NM, and have higher than usual standards for Mexican fare. If you'd like a crunchy coating for mild, flaky fish but don't want to deep fry, try dipping the fish fillets in an egg wash, then in seasoned bread crumbs. Bake the fish for a short while in a hot oven, and you should have the dish you were looking for -- but it'll be way healthier than a fried fish dinner. This also works quite well with boneless, skinless chicken breasts. For a side dish, I simply sauteed mixed baby squashes from the farmer's market, adding some diced shallot, chopped roasted red pepper (from a jar) and capers. To top the fish, I put a little of the sauce from the squash and served with lemon wedges. Pat fish fillets dry with paper towels. Place eggs and water in a medium, shallow bowl; add lemon-pepper and salt to eggs. Sprinkle bread crumbs on a large sheet of waxed paper and sprinkle thyme over top of crumbs. Using tongs, dip one fish fillet in the egg mixture, let excess drip off, then dredge fish in the bread crumbs. Use hands, if necessary, to evenly coat the fillet with seasoned crumbs. Place fillet on a clean sheet of waxed paper. Cover fish gently with more wax paper and refrigerate for 15-20 minutes. Meanwhile, preheat oven to 425 degrees. 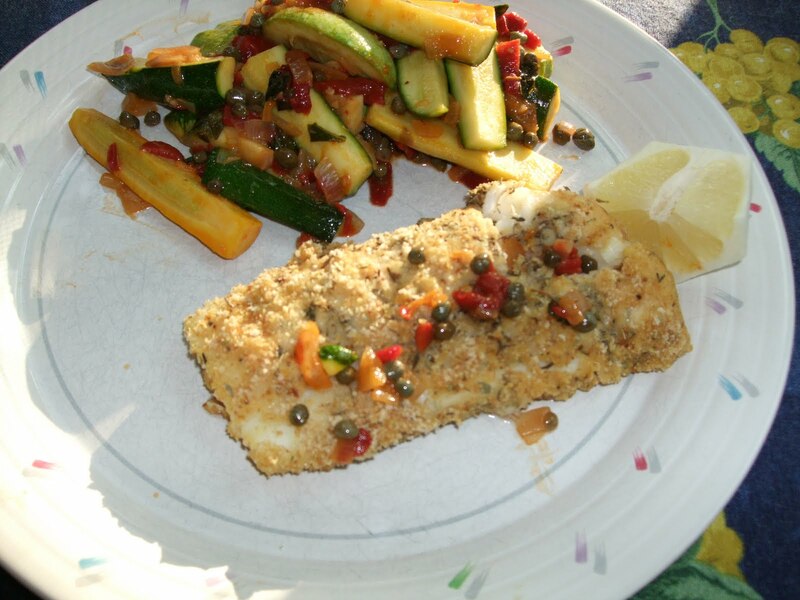 Place fish on a large baking sheet that has been coated with cooking spray. Bake fish in preheated oven for 10-12 minutes (depending on thickness of fillets). Remove when coating has begun to brown. Don't overcook -- the fillets will turn dry if they stay in the oven too long. I made a variation on my usual chicken-and-shrimp gumbo this time, with no shrimp and a little bit of sausage for extra flavor. 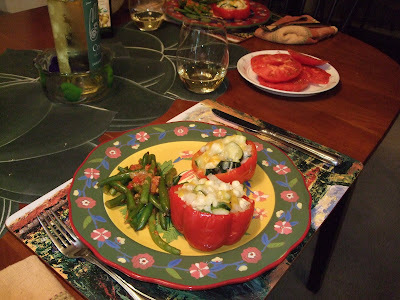 I also had some mild green chilies on hand, so added a couple of those along with the bell pepper. 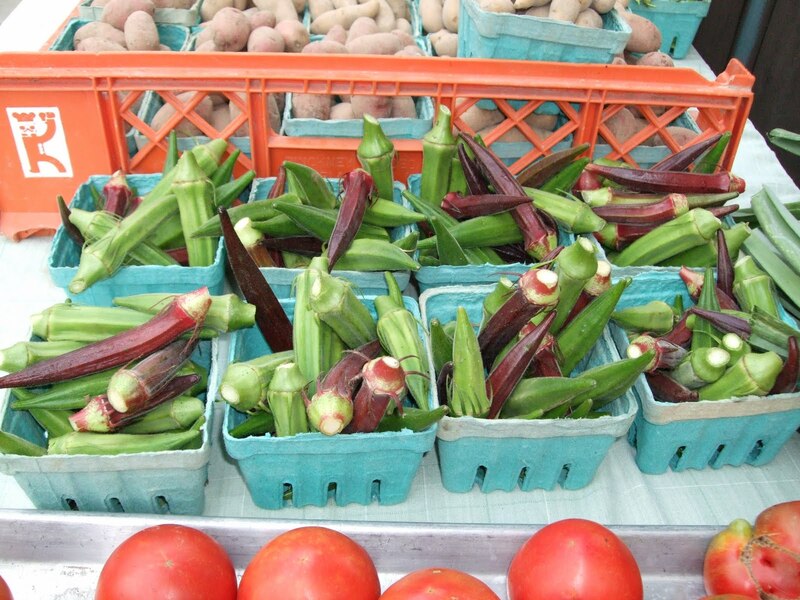 Of course, the main ingredient for gumbo is fresh okra. If you tend to shy away from this veggie, know that there's a simply cooking technique that gets rids of the slimy liquid and makes okra a delicious part of any soup or stew (among other uses). Simply slice the okra, discarding the stem ends, and saute in canola oil, stirring frequently, until the "roping" has stopped -- that is, until the white slimy liquid goes away. 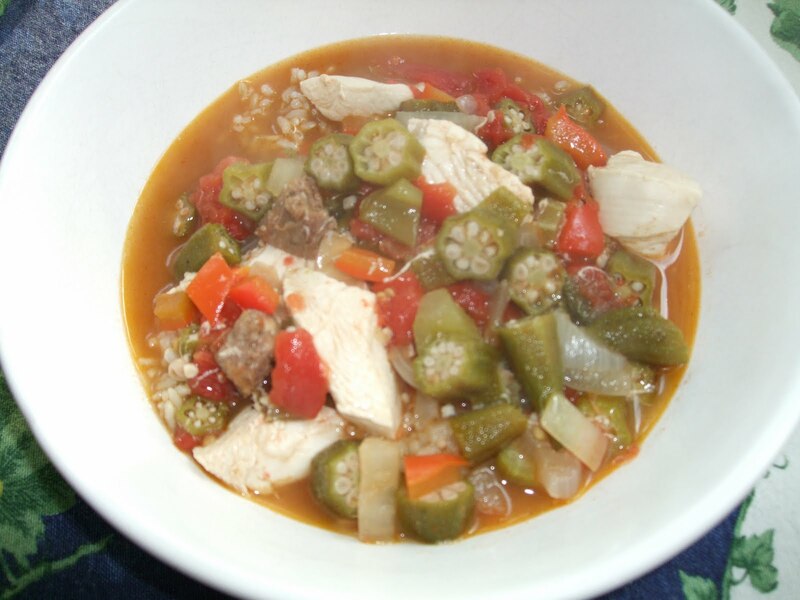 Set aside and add the cooked okra to your gumbo or other dish. Heat oil over medium heat in a large Dutch oven or soup pot. Add sausage and cook, stirring, until meat just begins to brown. Add next six ingredients (green pepper through jalapeno), stir well and cover the pot. Cook for 5 minutes, stirring occasionally, until vegetables begin to tenderize. Stir in file and/or flour and cook for 1-2 minutes. Add stock, tomatoes and okra. Season with salt and pepper, cover and reduce heat to medium-low. Simmer for 10 minutes, checking to make sure mixture does not get hotter than a slow boil. Add chicken, stir well, and cover. Cook for another 5 minutes, or 10 minutes if you are using dark meat chicken. Remove from heat and adjust seasonings, adding more salt if desired. Stir in Worcestershire sauce and lemon juice. Ladle soup over cooked rice (preferably brown rice) and pass hot sauce at the table. If you have leftover, store in the fridge for up to a week, or freeze for up to a month. Blueberries are my favorite fruit, bar none. They're almost always sweet, don't need to be hulled and cut up like strawberries, no peeling required, and so forth. And of course their nutritional profile could not be better. 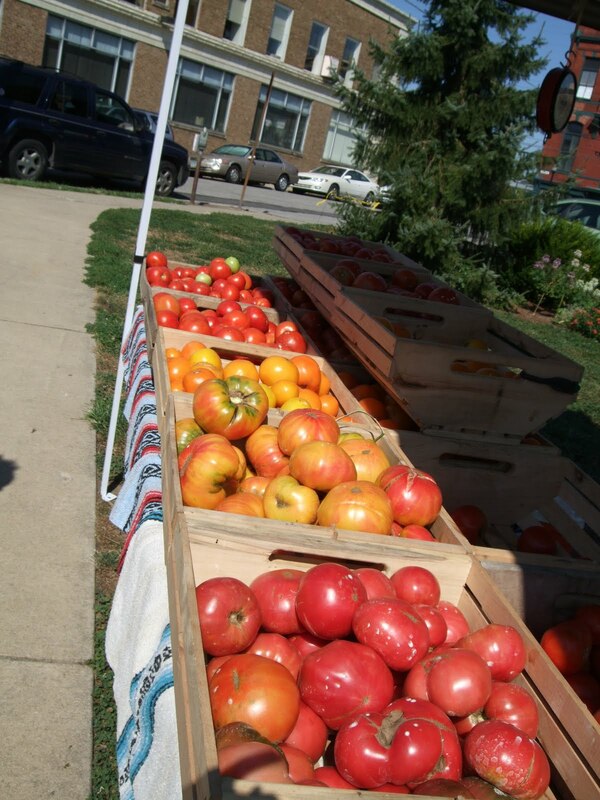 When they're in season -- NOW, but not for much longer -- I buy them by the quart and consume them daily. In summer, blueberries are an everyday feature of our breakfasts, no matter what else makes up that meal. Here's something different to do with a pint of these luscious berries. 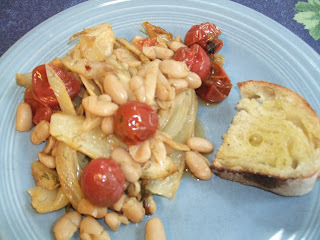 Here's a one-dish dinner -- we had it with the zucchini salad at right and toasted Italian bread -- that uses farm-fresh cherry tomatoes and delicious fennel (a.k. a. anise). Near the end, add a can of drained and rinsed white beans. I adapted the recipe from a recent issue of Bon Appetit. For wine, we opened a bottle of Sicilian red, a fruit-forward wine called Pinocchio (like the puppet). Heat oil in a large oven-proof skillet over medium-high heat. When pan is hot, add fennel wedges and cook until fennel browns on one side. Turn carefully with tongs and brown the other side. Stir in tomatoes, garlic, oregano and red pepper; add a little salt, if desired. Take pan out of the oven and transfer contents to a large serving bowl, sprinkling remaining fennel fronds over the top. 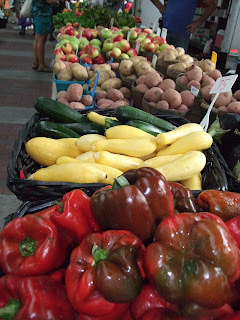 Just a few shots from this morning's visit to Findlay Market. 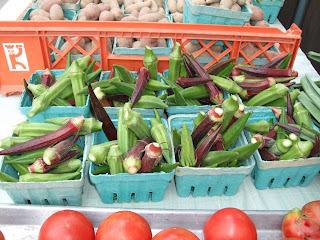 I'm cooking up a storm today and tomorrow: roasted fennel and tomatoes with white beans, and zucchini-ribbon salad for tonight; blueberry salad over prosciutto and melon for lunch tomorrow (having company); chicken gumbo with fresh okra for dinner tomorrow. All to be posted here soon. 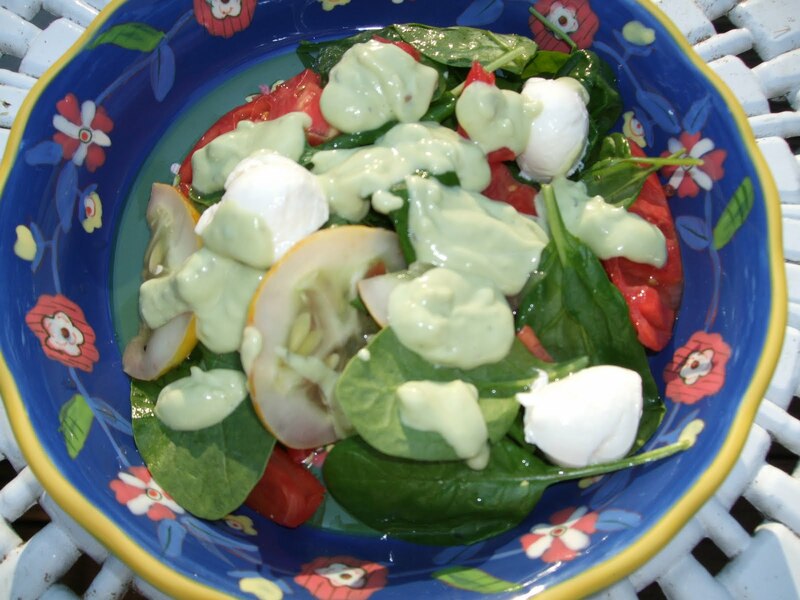 I had a very ripe avocado -- too ripe to toss cubes in a salad -- and thus I mashed it into an impromptu "green goddess" dressing to drizzle over slices of farm-fresh tomatoes, lemon cucumber (but any cuke will do) and a few spinach leaves. In a small bowl, mash the avocado with a spoon until it's fairly smooth. Stir in next 4 ingredients (yogurt through oil) and mix well, using a whisk or a spoon. 1 large, ripe tomato, cut in half and thinly sliced. Gently toss tomato, cucumber and spinach in a large bowl and divide into serving bowls. Sprinkle the cheese over each serving and drizzle with the dressing. 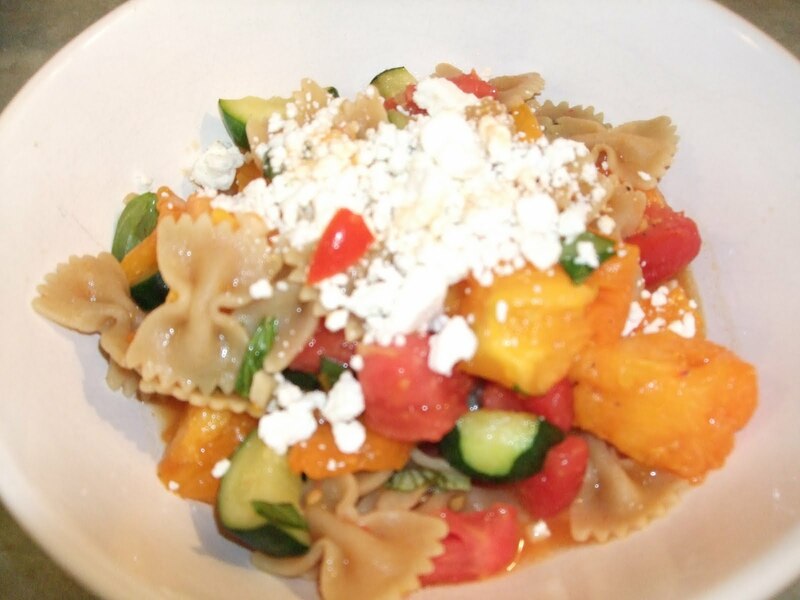 This simple recipe combines sauteed zucchini, bell pepper and garlic with chopped fresh tomatoes (uncooked) and seasonings, tossed with cooked pasta and topped with crumbled cheese. The pure flavors of the tomatoes -- a combination of red and yellow ones here, but you can use all red or all yellow -- really comes through loud and clear. Cook and drain pasta; set aside and keep warm. In a large skillet, saute zucchini, pepper and garlic on medium-high heat for 4-5 minutes, until zucchini starts to brown. Season with salt and pepper. Stir in reserved pasta plus the stock or broth. Stir gently until dish is heated through, about 3 minutes, then remove pan from heat. Add tomatoes and herbs to skillet and stir gently. Spoon mixture into serving bowls, adjust seasoning as needed, and sprinkle with cheese. Pass more cheese at table, if desired. 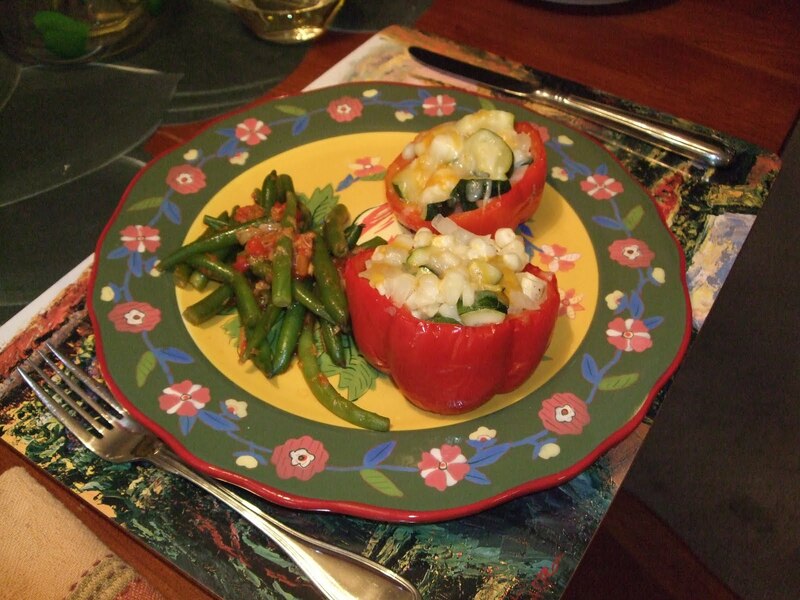 Serve with crusty Italian bread and a green salad. Wine pairing: A crisp white wine or a dry rose will go great with this dish. I'm heading to the Northside Farmer's Market this afternoon, my first market visit in weeks due to our vacation. One of the top items on my list is more fresh, local corn. 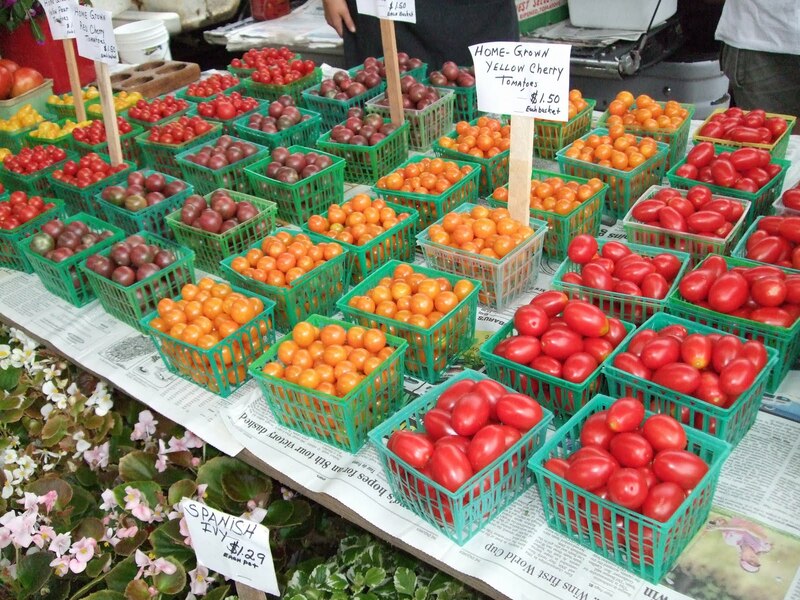 The season is so short that I want to enjoy as much of it -- and heirloom tomatoes -- as possible. 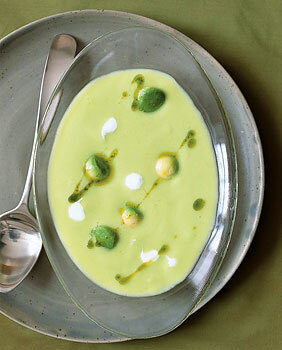 Combined with creamy, good-for-you avocado, corn provides the basis for this delicious cold summer soup. Cut kernels off cob, then cut corn cob into thirds. Heat water in a large saucepan until just starting to boil. Add corn kernels, cob pieces, salt and garlic. Boil for about 20 minutes, until liquid is reduced to about 3 cups. Remove from heat and cool, uncovered, discarding cob pieces. In a food processor or blender, puree corn mixture, onion and chile. Pour mixture through a fine sieve, discarding solids. Clean the blender/food processor and return mixture to it. Add one peeled, cubed avocado and 2 T lime juice to the mixture and blend well. Transfer to a bowl and chill well in the fridge. Peel and halve the remaining avocado and use a melon scoop to make small balls from the flesh (or just cut into cubes if you don't want to get that fancy). Toss gently with remaining lime juice. Divide soup into four to six shallow bowls. 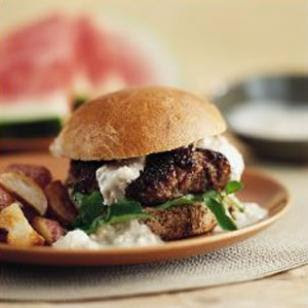 Top with avocado balls or cubes, drizzle with sour cream and add a little flavored olive oil for garnish, if you wish. Instead of actual cream, this delicious pasta recipe uses plain yogurt to give it a satisfying mouth-feel. 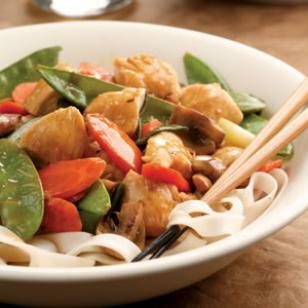 With sweet shrimp and array of fresh veggies, the dish is not only tasty but it's also a breeze to pull together. Mash garlic and salt in a large bowl until a paste forms. Whisk in yogurt, parsley, lemon juice, oil and pepper. Add the pasta mixture and toss to coat. 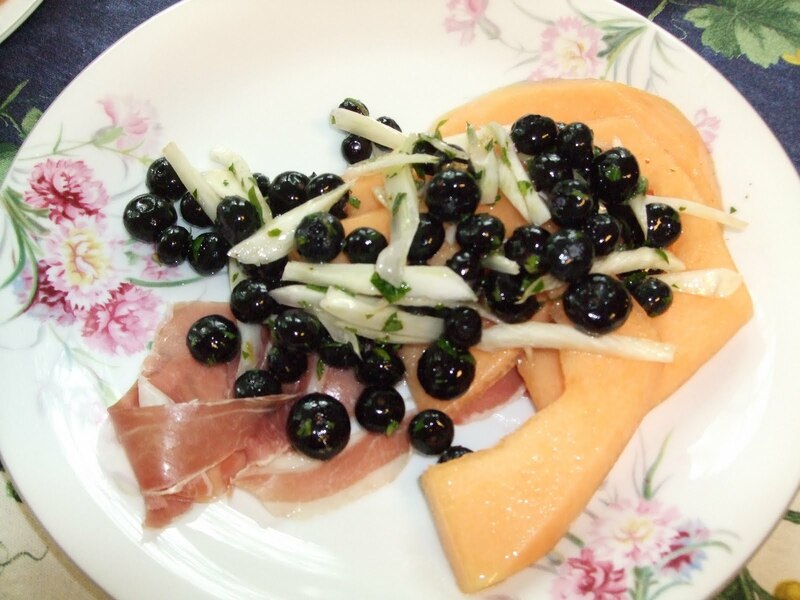 Serve sprinkled with pine nuts. Grilled eggplant sandwich -- go meatless! Processed lunch meats are some of the worst foods we can eat, health-wise, although if you buy nitrate-free, no antibiotics sliced turkey, it's not bad for you. If you want something a little more ambitious, not to mention really tasty, try this vegetarian treat. Spread 1 1/2 teaspoons of the garlic mayonnaise on each piece of bread. Layer the eggplant, mushrooms, arugula (or spinach), and tomato slices onto 4 slices of bread and top with the remaining bread. The patio restaurant at the Inn and Spa at Loretto in the center of Santa Fe was one of our favorite interludes in this interesting town. We stopped in for lunch under the arbor, a beautifully appointed space with lovely table linens, glass and dishware, and a guitarist playing discretely as patrons dined. 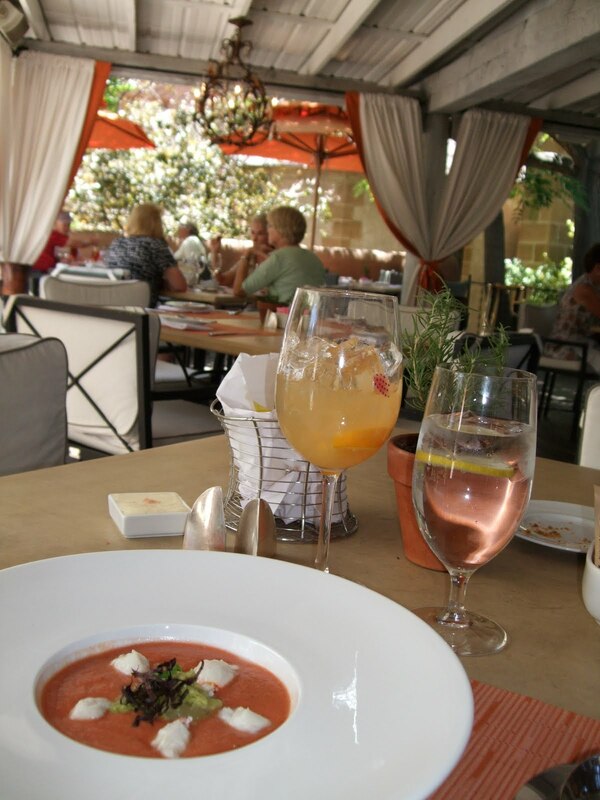 For eats, we each had a bowl of delicious gazpacho (top photo) and then split a "Santa Fe chopped salad." Should you ever make it to Santa Fe, NM--which has an almost overwhelming array of foodie choices--I'd recommend this as a spot to consider. The secret to whittling your waistline with these recipes isn't just that they're low in calories. It's in the ingredients: research suggests that eating more whole grains or including vinegar of any type in your diet may help reduce total body fat and abdominal fat. The combination of protein, fiber and healthy fats in nuts may help ward off weight gain as well. Many of these recipes include two, if not three of these ingredients—whole grains, vinegar and nuts—that can help you to stay trim. Place bulgur and 1/4 teaspoon salt in a small bowl. Pour the boiling water over, cover and set aside until the water is absorbed, about 20 minutes. Drain in a sieve, pressing out excess liquid. Meanwhile, heat 2 teaspoons oil in a large nonstick skillet over medium heat. Add mushrooms, onion and remaining 1/2 teaspoon salt; cook, stirring, until the vegetables are softened, 8 to 10 minutes. Stir in vinegar. Immediately transfer the mixture to a plate and let cool to room temperature, about 30 minutes. Toast pecans in a small dry skillet over medium-low heat, stirring, until fragrant, 4 to 6 minutes. Transfer to a plate to cool. Prepare Blue Cheese Sauce, if using. Combine the vegetable mixture and pecans in a food processor; pulse briefly until coarsely chopped. Add egg and the bulgur; pulse briefly, scraping down the sides if necessary, until the mixture is cohesive but roughly textured. Transfer to a bowl; stir in breadcrumbs and pepper. Mix well. With dampened hands, form the mixture into eight 1/2-inch-thick patties, using about 1/2 cup for each. Using 2 teaspoons oil per batch, cook 4 patties at a time in a large nonstick skillet over medium heat until evenly browned and heated through, about 4 minutes per side. Meanwhile, split and toast buns, if using, to serve the burgers on. Garnish the burgers with watercress and the cheese sauce, if desired. Go to this link to learn more and see additional belly-fat-trimming recipes! Huevos Rancheros is not a complicated dish, but it won't taste right unless you have a superb chili sauce. We had the huevos at Tia Maria, a down-home kind of joint in Santa Fe, NM. The basic idea is to place a warm corn tortilla on the plate topped with fried or scrambled eggs, ranchero sauce (with green or red chilies) and cheese. It's usually served with a side of beans and grilled flour tortillas. Also while in this town, we ate at a very well regarded tapas bar called La Boca, where we had the dishes photographed above, among others. Shown are the tuna carpaccio and grilled asparagus wrapped with smoked salmon. We just arrived in Santa Fe NM -- staying at the Hotel St. Francis just off the Plaza -- and lunched at the famed Coyote Cafe. Along with a watermelon mojito and top-shelf margarita, we split the shrimp seviche (foreground) and an order of vegetarian tacos. Great start to what promises to be a weekend of dining, drinking, shopping, sightseeing and a trip to the Santa Fe opera. Grate 1 T lemon zest and set aside, then juice the lemon and reserve juice. In a small bowl, whisk together the juice, soy sauce, broth and cornstarch; set aside. Add remaining ingredients and cook, stirring, until chicken is done and veggies are just tender. Add lemon zest at the last minute. Among the native American dishes we've tried, my favorite has been green chile stew, made with slow-cooked pork, pozole (a corn product like hominy), diced potatoes, onions and mild green chiles. It's served with Navajo fry bread (too rich for a healthy foodie) or grilled Navajo tortillas, which I like a lot. Here's a photo of one of the dishes, not the one I had though. I've been having some connection problems out here in the wilderness and can't upload my own photos at the moment. Turns out I was wrong about that. The scientific evidence now suggests a clear correlation between OBESITY and lack of sleep. In other words, the better your sleep habits the more likely you are to be able to keep a normal, healthy weight. Why this is true isn't completely well understood, but in any case we should all strive to get 7-8 hours of sleep a night. I can do this fairly well at home, but on the road (as we are now) it's just not possible for me. Click here for info about the relationship between sleep and weight control. And here for suggestions about how to get a good night's sleep -- routinely. Both Atkins (low-carb) and low-fat diets can help us lose weight, as several studies have shown. A new report once again has found that participants in both types of weight-loss diets lost about the same amount of weight after two years -- long time to be "on a diet," by the way. However, the Atkins followers actually had greater improvements in their HDL or good cholesterol readings. We're leaving Colorado, but here are a few parting shots of stuff we saw (no food this time). Next up: southern Utah -- gorgeous scenery, but the food might be only so-so until we hit Santa Fe NM later this week. These shots include the view of the Rockies from the Denver capitol building (top), followed by the big bear statue outside the Denver Convention Center, the view from my relatives' house in Lake Palmer CO, and a swimming hole in downtown Boulder (part of the lovely Boulder Creek). 1. Wash the spinach but don’t dry. Heat a large frying pan over high heat, and wilt the spinach in the water left on the leaves after washing. Remove from the heat, rinse briefly with cold water and squeeze dry. Chop medium-fine, season with salt and pepper, and set aside. 2. Break two eggs into a bowl, and beat with a fork or a whisk until frothy. Whisk in the milk, chives (if using), and salt and pepper to taste. 3. Heat an 8-inch nonstick omelet pan over medium-high heat. Add the olive oil. When the oil feels hot as you hold your hand above it, pour in the eggs, scraping every last bit into the pan. Swirl the pan to distribute the eggs evenly over the surface. Shake the pan gently, tilting it with one hand while lifting up the edges of the omelet with a spatula in your other hand. Let the eggs run underneath and set in several thin layers during the first few minutes of cooking. 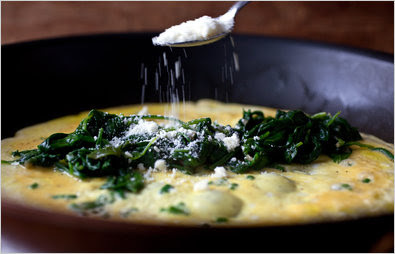 As soon as the eggs are set on the bottom and barely runny on top, sprinkle the Parmesan and then the spinach down the middle of the eggs. Jerk the pan quickly away from you then back toward you so that the omelet folds over onto itself. If you don’t like your omelet runny in the middle, jerk the pan again so that the omelet folds over once more. Cook for about a minute longer until heated through, shaking the pan gently. Tilt the pan and roll out onto a plate. Serve hot. This can be good at breakfast, lunch or dinner, depending on what you serve with it. From the NY Times health pages. 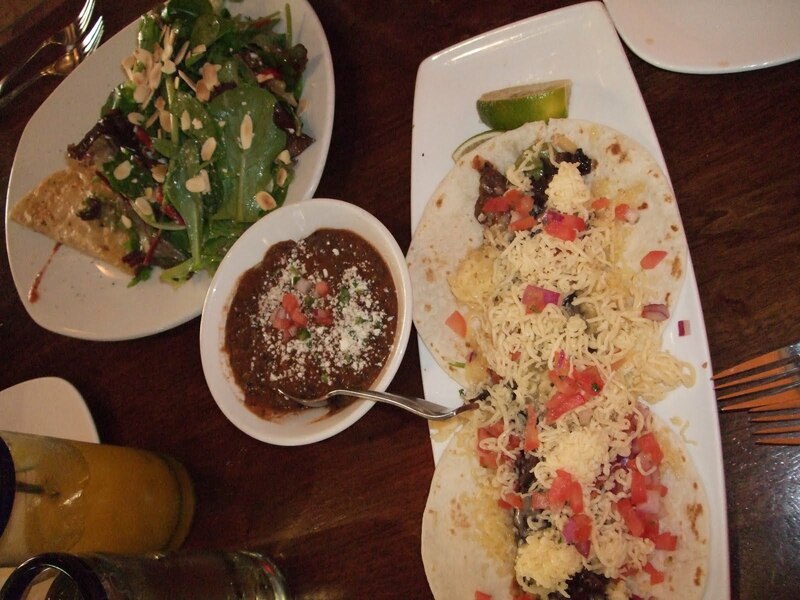 Friday was a great food and drink day for us in Denver. For lunch, we went back to Rioja, where we had dinner a couple of nights ago. It's on Larimer Street (I said Lattimer below, my bad) aka Larimer Square, the best part of Denver we've seen. Our lunch included the Rioja Picnic (top photo), quite a presentation, consisting of artisan meats, pine nut crusted goat cheese balls, a hunk of gorgonzola, an array of delicious olives (inside the lettuce cup), truffle fennel salad, orange confit and almonds. Plus the crackers. Yum. George had a terrific halibut dish -- second photo -- with all kinds of great veggies. For dinner we went over to the Highlands District to Lola, the Mexican spot. Very creative approach to the food, nothing at all ordinary, and all quite good. The tableside guacamole service was a treat. My friend and I both had grilled escolar with chorizo enchiladas -- a terrific dish but way too big a portion. We've been in this city (& environs) since Wednesday and have found a few good eats, and definitely some fine liquid refreshments. On a day excursion to Boulder, about a 30-minute bus ride as we don't have a car right now, we discovered an upscale but casual vegetarian resto called Leaf. Top photo is the mushroom burger I had there. Another good dish was the berry salad (middle photo) at a place down the street from our hotel called Marlowe's. And one of the most fun finds was a wine bar and small-plates spot called Cru in the Lattimer Square neighborhood (bottom photo), where we enjoyed excellent wine flights and a cheese plate. We have another couple of days to branch out and explore. I'm at a journalism/mass comm conference, so some of the time I've been tethered to the hotel. After Saturday, we head west to Utah and New Mexico for a completely different experience, which you can read about here! Stay slim by doing this -- daily! That is: always start your day with a healthy breakfast. Even a less-than-healthy breakfast (bacon and the like) is better for your weight control than none at all. Found some healthy foodie choices in the town of Manitou Springs, CO, after our ascent of Pike's Peak. It's a cute if touristy town with plenty of food and shopping options. Luckily, my cousin Peggy knew a reliable restaurant. She picked Adam's Mountain Cafe on the main drag. We had spent 5 hours doing the mountain, it was 2:30 PM and we were famished. Along were George, me, my aunt Marie, cousin Peggy and brother Don (from Raleigh NC) and his wife Jo. My husband ordered a veggie sandwich (top photo), which he said might have been the best veggie sandy he had ever had. My Thai vegetables with tofu over brown rice (bottom photo) was exactly what I needed. Today (Weds) we leave the family and head for Denver where I have a conference. My husband spotted an exciting new restaurant and wine shop preparing to launch in Hyde Park/Norwood, Cincinnati. It's called Wine Guy Wine Shop, Wine Bar and Bistro -- yes, that's a long name -- a Columbus OH based venture moving into the space in Rookwood Pavilion where Smith & Hawkins used to be. Here's the link to the info on their website about their expansion into Cincinnati. A photo of one of the owners is above. The Columbus menu looks fairly casual and inexpensive, focusing on pasta and pizza, although there are a few dinner entrees in the $20-$25 range. What's most interesting, though, is that we will finally be getting a real wine bar--with wine flights, something we have lacked since Vineyard closed, and even they weren't doing flights right. The Columbus menu lists 6 different flights, four tastes of each priced at about $15. The choices look pretty standard, to tell the truth, but perhaps they'll get more adventurous in the future. Stay tuned for more news on this as it comes in. Here's another way to enjoy some of the best crops of summer -- sweet corn, profuse zucchini and local garlic (which, by the way, tastes sooooo much better than supermarket garlic shipped from thousands of miles away). 1. Preheat oven to 450 degrees. Lightly oil a baking sheet. 2. Halve peppers lengthwise, leaving stems intact. With a paring knife, removed seeds and ribs. Place peppers, cut side down, on the baking sheet. Bake for 8-10 minutes until peppers are just tender. Set aside and reduce oven temperature to 375 degrees. 3. Meanwhile, heat oil over medium heat in a large skillet. Add onion, zucchini, garlic and jalapeno. Cook, stirring occasionally, until vegetables soften, about 5-6 minutes. Stir in corn and cook briefly just to heat the corn. Remove from heat and let cool. Add salt, pepper, cheese and herbs. 4. Divide mixture among pepper halves and place back on the baking sheet. Add a couple of tablespoons of water to the pan, cover with foil and bake peppers for about 15 minutes. Uncover and bake for 5 minutes longer. Serve.